We have been using email for decades now. A lot of things have changed. But one thing has not – most of us don’t have the discipline of managing the mailbox in an optimal way. I am not asking you to do a spring cleaning of your mails. I am showing you immediate actions you can take to make your mailbox management (and communications) more efficient. Many of us got irritated and chose the option Don’t prompt me about this again! There goes your chance of keeping the mailbox clean and light. The idea is simple. AutoArchive does many things which are good for you. So just run it periodically. You have not run it before? Then run it now. I am assuming Outlook 2010 or above. Now a bigger dialog appears… You can explore other things later. Just click on the AutoArchive button. And let it do its job. It may take a long time. Status is shown on the status bar. Look at the options and tweak them as required. Basically, it moves old items and puts them in a new PST file – ARCHIVE.PST. 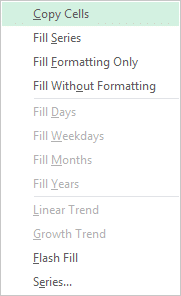 Make sure you click the Apply these settings to all folders now option. Later you can right click on a specific folder – go to properties and customize the settings if required. 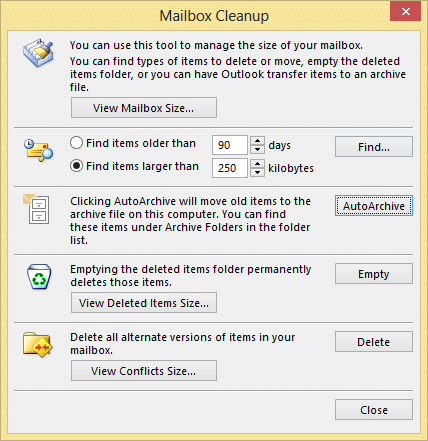 Only deleted items which are older than the cleanup limit (default 6 months) are deleted. Everything else is moved to the archive PST file. No mails or calendar items are deleted. Contacts folder is never archived – that means all your contacts are always available in the main mailbox. You don’t have to do anything special for this. 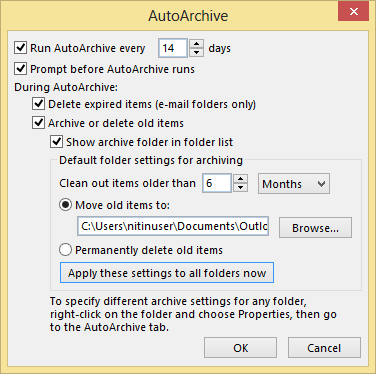 Outlook search indexes the Archive PST files as well. So these are available for navigation as well as regular search. If the archive file is big, indexing may require some time to finish the job. It is a good idea to check the indexing status and if many items are pending. 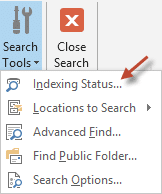 To check the indexing status, go to Inbox – click inside the search box – on the search Ribbon, choose Search Tools – Indexing Status. 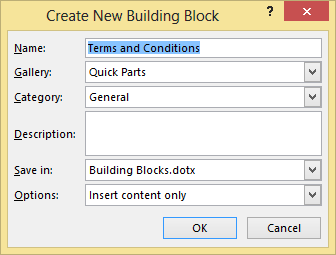 The dialog below shows the pending number of items. Ideally there should be zero or very few items to be indexed. If a large number of items are shown here, leave the machine on overnight and check in the morning again. That should give enough time for indexing to finish the backlog. The pst file is created on the PC on which you run the AutoArchive. Therefore, items which have been moved to the archive folder will NOT be available to you when you are working on a mobile phone or any other mailbox only device. Best Practice: Whenever you finish handling a mail, it should not remain in the Inbox. Delete it. Or if you want to keep it, keep it in a PST folder. Not in the main mailbox. If you follow this simple rule, you will never face a problem of mailbox filling up every now and then. 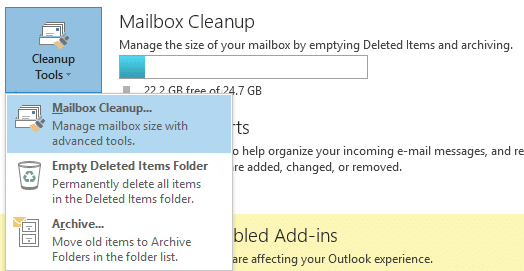 By the way, Office 365 subscription gives you a mailbox that is 50 GB in size… did you know that? 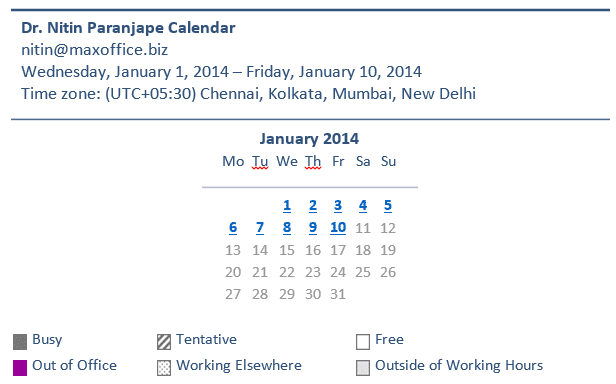 Calendar view shows only Day, Week, Work Week and Month views. You can only select all appoints within a month. Even in the month view, CTRL A does NOT select all appointments. 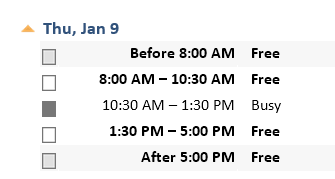 In short, any bulk operation you want to do for appointments is a pain. Solution is simple. 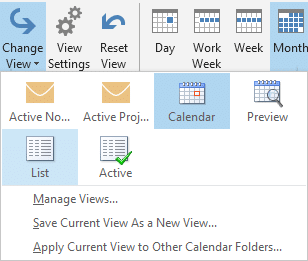 Just change the view in Outlook. Now all the appointments and meetings are shows as a simple list – like Inbox or Tasks..
Now you can sort, filter, multi-select any number of items and perform any operation you like – for example, Delete 0ld appointments or archive to another folder or PST. Most of us don’t want old appointments to waste space in the mailbox – because the space is limited. The smartest way to clean this up is to run AutoArchive. We will cover this in the next article. 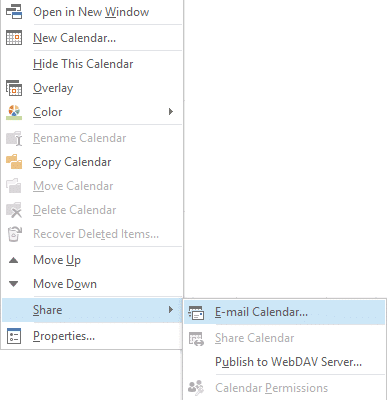 How to share calendar with external parties? Often we need to arrange a meeting with some external party. Both are busy people. How do you share your free time with the other person? Within the company, if you are using Exchange and Outlook, you can see each other’s Free / Busy time. But for external parties, this facility is not available. Go to the Calendar… let us say it looks like this for next two weeks. Choose the duration and level of detail you want to show. Usually there is no point in showing more than couple of weeks because the schedule is bound to change. 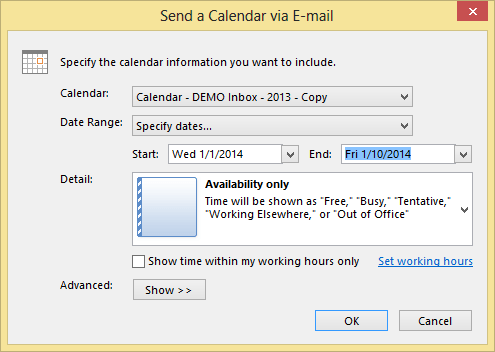 Click OK. Now a new email message is created with a calendar showing free and busy dates. Ctrl Click on each date to see the availability. Clicking on the hyperlink jumps to the details for that day. This way the other party can find mutually convenient time without trial and error! Key Learning: Right Click > Read Each Option >Learn! Did you know Right Drag Drop works? This article assumes that you are a right handed person, if you are a left handed person, you have to use the other mouse button (secondary mouse button). When you drag and drop items, the most commonly expected logical action happens. For example, when you drag a file from one folder and drop it into another folder, it is moved. That is called the DEFAULT ACTION. Another example is… when you drag a number from the corner of the cell, it automatically adds further numbers. This is a good thing in most cases. But if you don’t like the default or standard action, then you have a problem. To solve this issue, there is RIGHT DRAG DROP. That is called Right Drag (Drop). So what is the big deal? What benefits do you get? Here is what happens if you right drag drop a file… The item in bold tells you what is the default action. 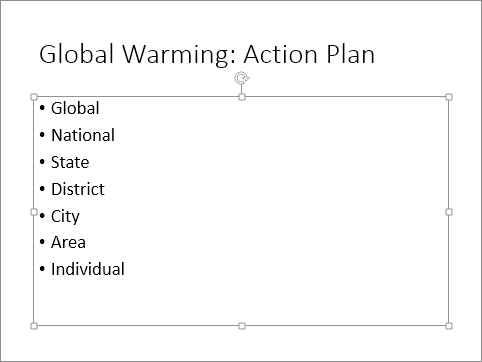 Suppose you are talking about global warming – and want to show that action can be taken at various levels – starting from the lowest level – each individual. You want to talk about each item one by one. Therefore you added animation. 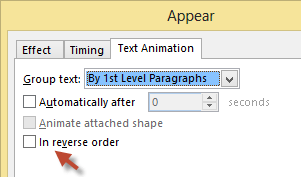 Select the text box – Animation – Add Animation – Appear. Now when you run the slide, each click will expose one bullet at a time. This is good because you get time to explain each level. Therefore the audience cannot read ahead of what you are speaking. 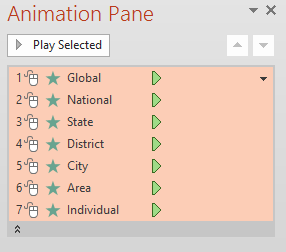 Click on Animation tab – Animation pane. A window (pane) appears on the right side. Currently it shows only one entry but actually it has many entries which are collapsed to reduce clutter. The double down arrow can be expanded to show the animation for each bullet. 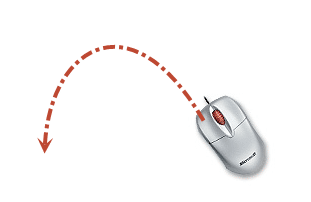 The animation is simple – each item is triggered by a mouse click. The problem is the order. Can it be reordered? Of course… you can simply drag drop the animation sequence to reorder it. But wait… just because it works does not mean it is the best way. In fact it is the worst way – why? Because repetition is inefficient! Notice that there is a nice tab for text animation. Imagine, Microsoft thought of your needs 20 years back and provided that “in reverse order” checkbox, which displays your bottom up approach very nicely. You had a problem all along – the solution was with you all along. All that you need is already there. If you have a presentation which covers multiple topics and you want to have the interactivity to move from a main menu page to any topic, this article is for you. White colored slides are the base presentation. Second slide is sort of an agenda and menu slide. You ask the audience which topic they want and then click on the desired option. Blue slides are for Word, green for Excel and pink for PowerPoint. 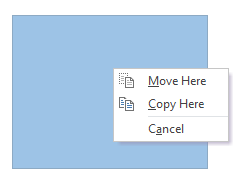 If you clicked on, say, Excel icon in second slide, then PowerPoint should show slides 6,7,8 and then COME BACK to slide 2. 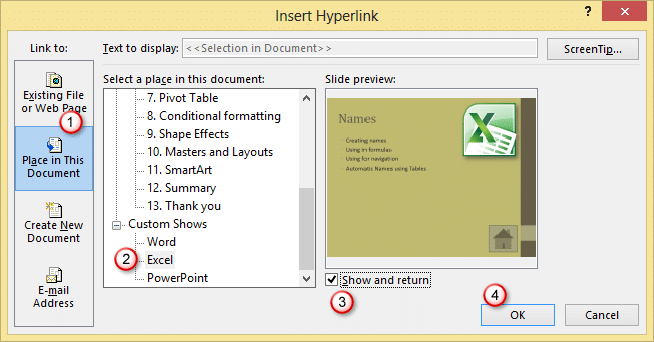 Usually you will put hyperlink on the Excel icon to jump to slide 6. But you know the problem – it will just go to all slides after 6 and spill over to the PowerPoint slides. To avoid that we put another link on the 8th slide which gets you back to second slide. There is a better way – using Custom Shows. Please read the previous article to understand how to create custom shows. This is easy. Just create three custom shows called Word, Excel and PowerPoint. Choose the CUSTOM SHOW in the hyperlink. The Show and return option is your best friend … but you never noticed it till now. Ha ha… why? Because most of the times this option used to be inactive – why? because this option requires you to select a custom show. And you did not ever create a custom show… why ? never mind. Now you can run the presentation in an interactive manner. What if you want to return to the main menu slide while you were half way through the Excel custom show? Don’t worry… just press Escape. It will go to the base slide. Next escape will stop the slide show (as expected). So remember, if you are in custom show, escape takes you one level back. 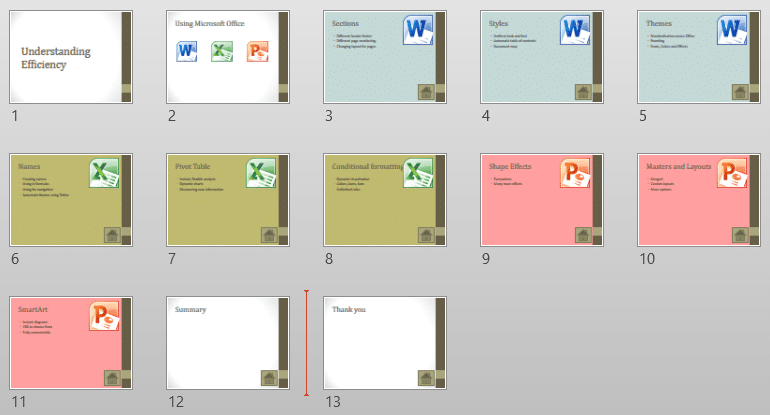 Office 2010 onwards, you can add sections to presentation to segregate various topics. These are similar to Custom Shows but following things are different. I will cover sections in another article later. Concept is simple. Create a Custom show. Choose only the key slides. Save it. Run the custom show instead of the entire presentation. Very simple. This image is for PowerPoint 2013. 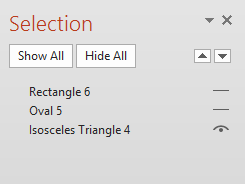 Older versions do not have the checkboxes for selection, but you can press Ctrl Click for multi-select. 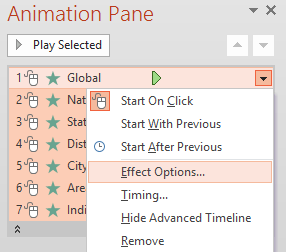 If you know that you need the shorter version BEFORE you started the presentation, then Open the custom show drop-down and run the show. 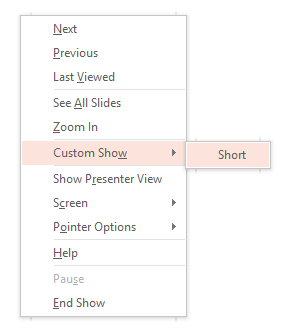 If you have already started the regular presentation and are now short of time, just right click and choose Custom Show. Always keep a shorter custom show ready for all long presentations. 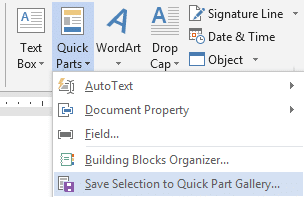 Quick Parts in Word: Stop copy pasting from old files! 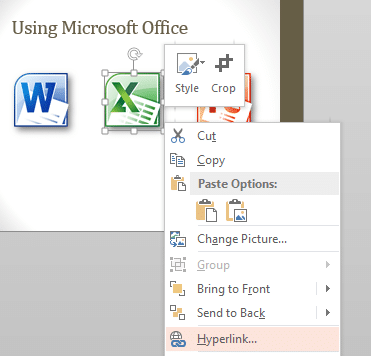 Often we need to open an existing document, copy some part of it and paste it into another new document. Why does this happen? Because that part of text (or content) was reusable across documents. There is a much better way to reuse text – called Quick Parts. Be on the lookout for text which is reusable. Select it and choose Insert – Quick Parts – Add to Quick parts gallery. You can now specify a name for the content. You can even create different categories – by activity or department, for example. Notice that this content is stored in a special file called BulidingBlocks.dotx. Now the content is stored. You can use it in any document quickly. 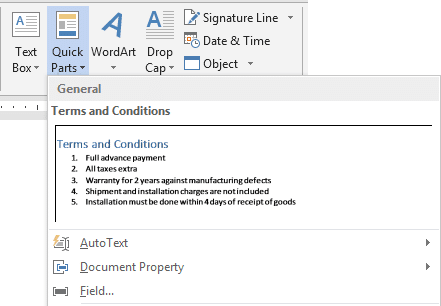 Insert – Quick Parts – the content is now shown as a drop-down list. Click on it to insert it into the current document. That’s it. 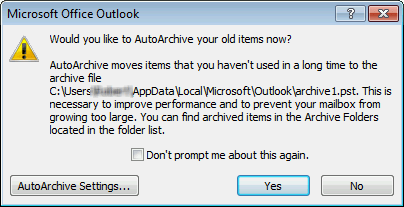 Outlook uses Word. 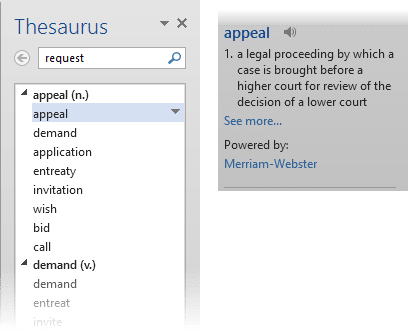 Therefore, the same functionality is available in Outlook as well. You can easily standardize the usage of building blocks across the organization. We also have similar use concept for tables – Quick Tables, textboxes, headers and footers. All these are stored in the same building blocks file. PowerPoint slides can get crowded. If you have multiple overlapping objects, reaching the objects which are behind other objects is a very problematic area. You have to either struggle with Send to Back / Front or move the overlapping objects manually. Both methods are a compromise. 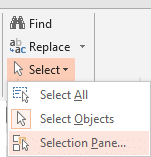 Since Office 2007 Microsoft added Selection Pane. Once you know how to use it, you will wonder why you did not know this earlier. It will save you hours of struggle. 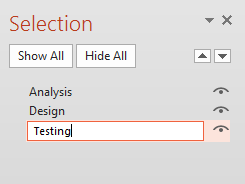 Home – Select – Selection Pane. It is so simple but so effective. It shows a list of all objects on the slide. The object on top is physically in front of all objects. The object at the bottom is behind all objects. Each item can be hidden by clicking on the icon of the eye. So if you want to select and work with an object at the bottom, simple hide the objects on top. If an object is hidden, it will not be shown in the presentation. Therefore, after your work is done, remember to choose SHOW ALL. Selection Pane also allows you to change the default names given to objects. Naming objects makes it easy to animate them and rearrange them. When you are creating complex slides, keep the selection pane open and change the name of an object as soon as you add it. Reordering objects is much easier using Selection Pane rather than struggling with Send to Back / Front. You can use the up/down arrows or drag drop (2010 onwards) to reorder items. Grouped items can be moved together. If you use custom shows, you will need to see the titles of slides. If there are slides with the title textbox removed, you cannot see the title. The list only shows you slide number. This leads to a lot of confusion. In such cases, add the title but hide it. That way the title is shown in Custom Show dialog but it is not visible in the presentation… best of both worlds! This is a very useful feature. Add it to the Quick Access Toolbar. 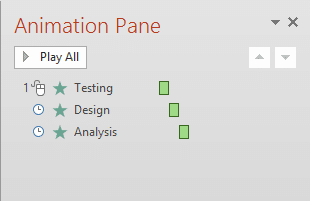 Other good candidates for QAT are Alignment dropdown, Format Painter, Animation Painter, Clear Formatting and SmartArt. Although it is most useful in PowerPoint, remember to use it in other products as well.